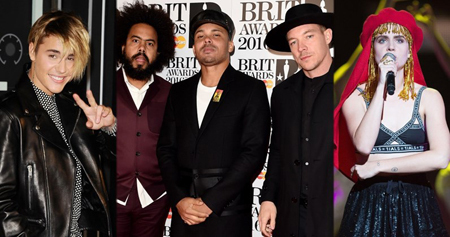 Major Lazer’s collaboration with Justin Bieber and MØ is the UK’s Official Singles Chart Number 1 for a second consecutive week. Cold Water has passed 100,000 chart equivalent sales for the second week in a row with 104,000 of you buying or streaming the track over the past seven days. The Ed Sheeran-penned song was the most streamed single of the week and outperformed its 102,000 garnering figure from last week. Calum Scott’s slow burning single Dancing On My Own climbs one place to Number 2, a new peak after 15 weeks on the chart. Jonas Blue’s BPI certified Silver single Perfect Strangers falls one place to 3, followed by two non-movers – The Chainsmokers’ Don’t Let Me Down and Drake’s One Dance at 4 and 5 respectively. Bastille’s Official Trending Chart Number 1 Good Grief climbs two positions to 13, while MØ’s Final Song enjoys a similar experience, up two to 15. A bigger jump comes from girl group M.O; their hit Who Do You Think Of becomes their first Top 20 single, rising seven places to 18. Three high climbers follow shortly after at Numbers 20, 21 and 22. twenty one pilots’ Heathens becomes their second Top 20 entry, up 14 to Number 20, Titled from Christine and the Queens jolts six places to 21 and Anne-Marie’s Australian Top 10 single Alarm rises 10 spots to 22. Halsey scores her first Top 40 single courtesy of her featured slot on The Chainsmokers’ new entry Closer (33) and finally, Fifth Harmony’s All In My Head (Flex) springs into the Top 40 for the first time, up 10 to 36. This entry was posted on Friday, August 5th, 2016 at 5:59 pm and is filed under Music News. You can follow any responses to this entry through the RSS 2.0 feed. Both comments and pings are currently closed.